Russia is keen on selling its new fighter jet MiG-35 to India with the MiG corporation’s chief saying the country has evinced interest in the aircraft and talks were on to understand its requirements. Director General of Russian Aircraft Corporation MiG Ilya Tarasenko said the MiG-35 was “the best” and definitely better than Lockheed Martin’s fifth-generation combat aircraft F-35. He claimed that the MiG-35 would beat the American jet in air to air combat. Tarasenko, while talking to reporters on the sidelines of the MAKS 2017 air show, said after having presented MiG- 35 in January, the MiG corporation began to actively promote the aircraft in India and in other parts of the world. “We are proposing supply of the aircraft for tenders in India and we actively work with its Air Force in order to win the tender,” he said. The MiG-35 is Russia’s most advanced 4++ generation multipurpose fighter jet developed on the basis of the serial-produced MiG-29K/KUB and MiG-29M/M2 combat aircraft. MiG aircraft have been used by India for almost 50 years and MiG corporation proposes its new products to India among the first countries and intends to continue supplying India with its most modern aircraft, the MiG chief said. “Since this is a very new plane, it will still take some time to negotiate on exactly what India needs and adjust the product to it,” he added. Talking about the cost of the plane, Tarasenko said it was economical due to the after-sales services being offered along with the aircraft. “We propose not just the aircraft, but also training for its use, as well as after-sales servicing where we take upon the responsibility to service it for 40 years,” he added. He stressed that in comparison to its competitors, the prices offered by MiG were 20-25 per cent cheaper, making it an attractive option for those who wish to purchase this aircraft. Highlighting the main features of the MiG-35, Tarasenko said its technical specifications were close to a fifth generation aircraft, namely its flight capabilities, its new weapon range and defence systems, including stealth. “I would like to note the demand for this aircraft for our own air force, as well as our foreign partners. The plane is light, multi-functional and has high manoeuvrability,” Tarasenko said, adding that the MiG was also offering special commercial terms to its partners. He also stressed that the plane was fully Russian-made with Rostec companies like United Engine Corporation (UEC), KRET and Technodinamika participating in the project. At MAKS 2017, the MiG-35 grabbed all the limelight as it took to the skies and enthralled the audience with breathtaking manoeuvres like the tail slide, barrel roll and the nesterov loop. Meanwhile, Director of Russia’s Federal Service for Military and Technical Cooperation Dmitry Shugayev also said that Russia is ready to take part in India’s tender for the supply of light fighter jets with its MiG-35 plane. “Principally, Russia is ready to participate in future aviation tenders in India. However, as of now, we do not have information on the opening of a tender and, correspondingly, on the plane’s technical requirements set by the Indian side,” he was quoted as saying by Russia’s TASS news agency. Mikhail Belyaev, the Lead Test Pilot of MiG-35, told reporters that the main feature of this aircraft was the new on board equipment and the new quality of weapons — air-to- air, air-to-ground and air-to-sea. “Compared with the basic version of the MiG-29, it is a new aircraft, new airframe, fly-by-wire, glass cockpit, adapted for night vision goggles…new engines, more power, more fuel, new on board equipment and new weapons,” said Belyaev, who was earlier this year presented the star of the ‘Hero of Russia’ by President Vladimir Putin for bravery in piloting and testing of aviation equipment. Asked if it was easier to fly MiG-35, Belyaev said new tasks were required for such an aircraft so one needs to learn these. “On the basic level it is not that difficult to switch from MIG 29 to 35 as the plane remains the same. It is still a light simple plane. The combat tasks that can be achieved from this plane are much more serious and much more complex,” he said. “More combat tasks can be achieved from this plane than with the MiG-29. So it will take time to learn new tasks and to adapt,” he added. An overhauled MiG-35 multi-role fighter completed a successful demonstration flight at the MAKS 2017 air show, with Russian officials saying the first combat-ready plane will be delivered to the Air Force next year. The fighter jet features improved flight and technical characteristics, the most advanced on board radio-electronic equipment and a wide arsenal of air-to-air and air-to-surface missiles. The flight tests of MiG-35 fighter aircraft began on January 26 and the plane’s international presentation was held in the Moscow Region on the following day. The MiG-35 (single seat) and MiG-35D (double seat) are the “4++” generation multi-role fighters, exhibiting the further development of the MiG-29K/KUB and MiG-29M/M2 fighters in the field of the combat efficiency enhancement, universality and operational characteristics improvement. – increased combat survivability due to integration of airborne integrated defense system. – participation in group actions and air control over groups of fighters. – three channel fly-by-wire control system with quadruple redundancy. – the MiG-35 aircraft is intended for the on-condition maintenance. The complex of technical and technological solutions has been developed for the MiG-35/MiG-35D aircraft which provides for independent operation, like airborne oxygen generation plant. Upon customer request the fighters can be equipped with “all aspect” thrust vectored RD-33MK engines ensuring the aircraft superiority in the maneuvering dogfight. The power plant of two thrust vectored engines was tested on the super-maneuverable prototype-aircraft MiG-29M OVT. 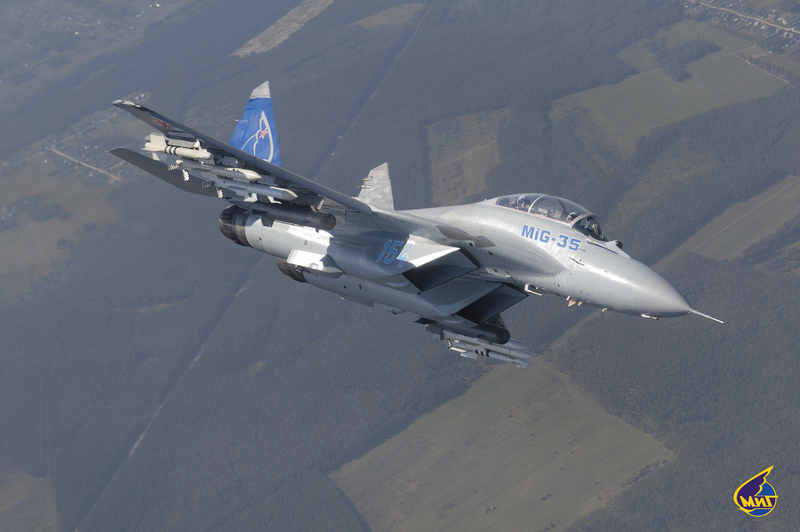 The airborne avionics of the MiG-35/MiG-35D aircraft is developed on the basis of the new generation technologies. – high jamming protection and survivability. The IRST system with infra-red, TV and laser sighting equipment has been developed using the space technologies which were not applied previously in aviation. The system distinctive features are the increased range, detection, tracking, identification and lock-on of air, ground/surface targets in the forward and rear hemispheres, at day and night measuring the distance with laser range-finder as well as the formation of target designation and laser illumination of ground targets. The IRST system and new helmet-mounted target designation system are integrated into the armament control system. 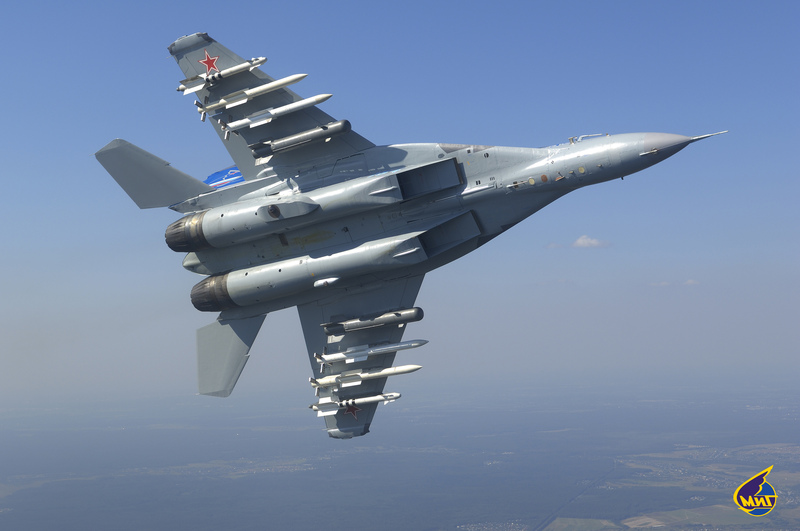 In addition to the built-in IRST system the MiG-35 aircraft is equipped with a podded one. – decoy dispensers to counteract the enemy in the radar and infrared ranges. 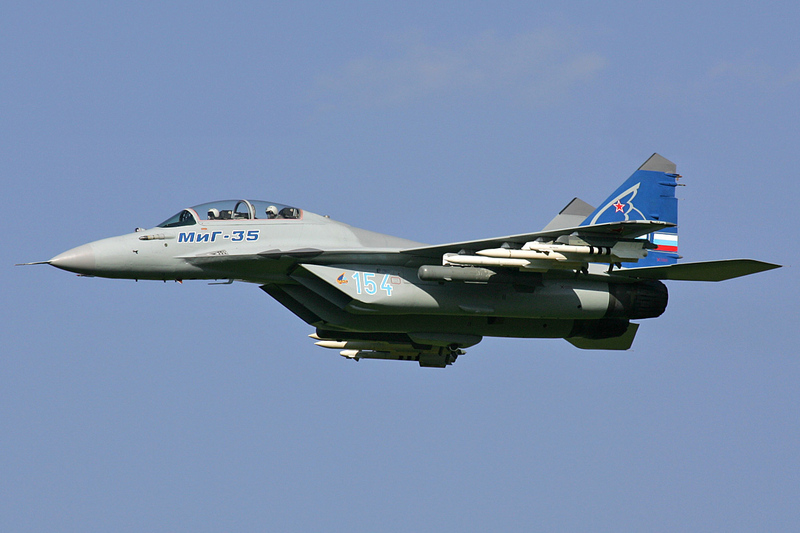 In addition to the “A-A” and “A-S” class weapons applied on the MiG-29K/KUB and MiG-29M/M2 aircraft the advanced aircraft armament, which have not been offered earlier for export, is being included into the MiG-35/MiG-35D aircraft weapons. The long range weapons capable to attack targets without approaching the air defence zone are among them. For the MiG-35/MiG-35D fighters the full set of training means was developed including the interactive computer-based training system and a number of simulators including the full-mission simulator with a motion system. The basic version of the MiG-35/MiG-35D fighter is designed taking into account the international cooperation organization when developing new modifications of aircraft and during serial production. Russian Air Force – 30 on order, 170 planned. 6 aircraft from order to be delivered to Russian aerobatic team Swifts. The MiG-35 is under development and specification data may change.